This week I participated in a Dollar Store Holiday Decorating Challenge. I made peppermint stick candles. While I was browsing around the dollar store, I noticed several things I thought would make good gifts. So in addition to the peppermint sticks and candles, I brought home several other goodies. Here are the gift items I came up with. Maybe you could use some of them, too! 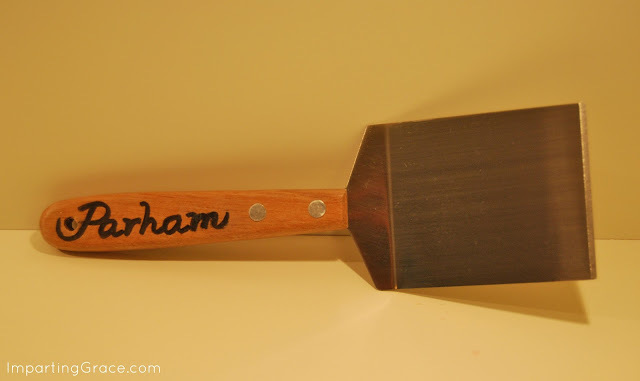 I just used a Sharpie to add a name to a wood-handled spatula. I've had one of these spatulas for years and just love it--it's a great little tool and very sturdy. I made one for a friend and made this one for myself. Again, I used a Sharpie and free-handed "Quid pro quo" onto the backscratcher's handle. Get it? 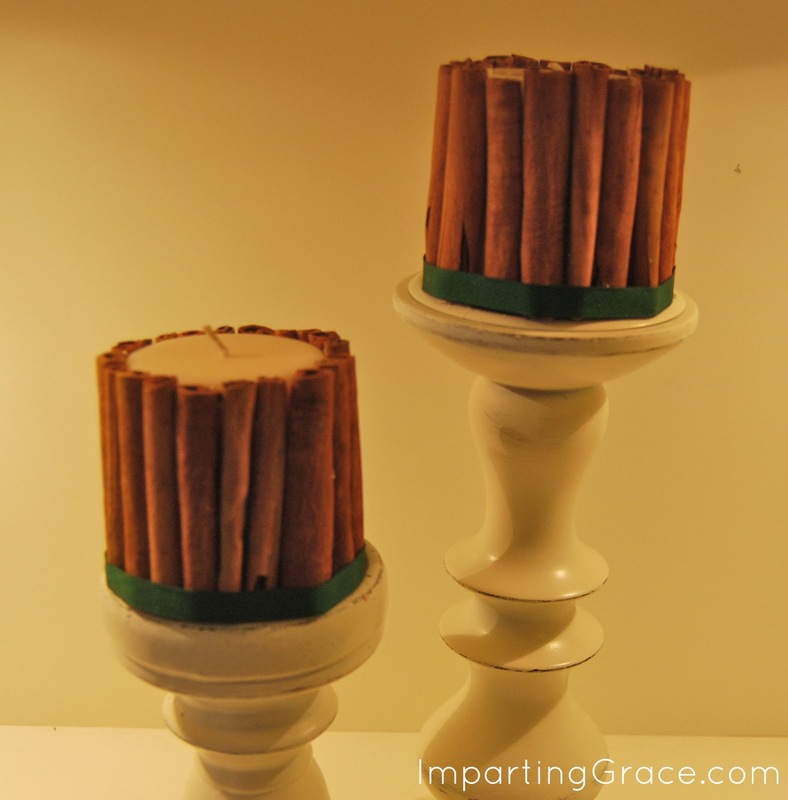 I simply cut cinnamon sticks the same length as the height of two pillar candles and hot-glued them on. 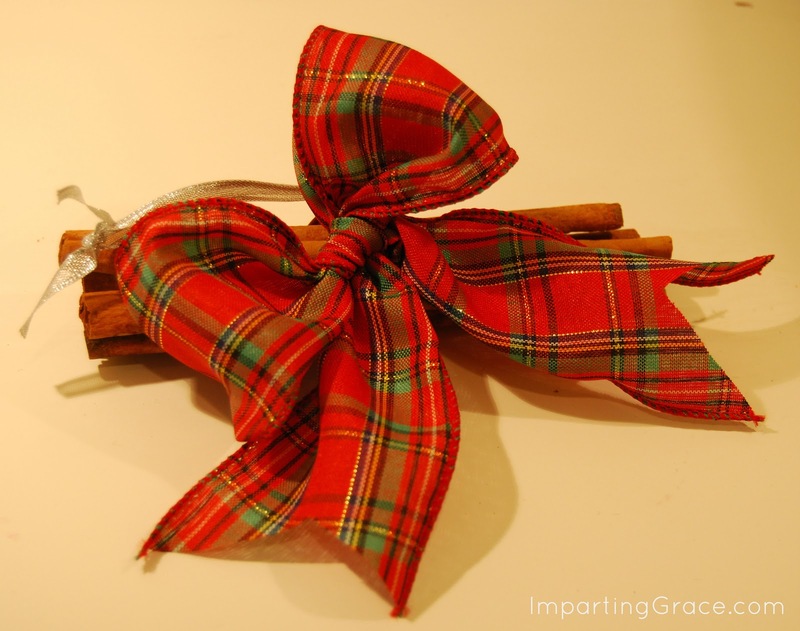 This is just three cinnamon sticks tied with a bright bow. I attached an ornament hanger to make it easy to place on the tree. This would also be great tied on top of a package. Note: To make my cinnamon stick creations even more delectable, I rub some of this oil onto each cinnamon stick. You can't buy this at the dollar store, but I think it's worth the investment. This is my favorite Christmas scent, and the cinnamon sticks are the perfect absorbent surface. 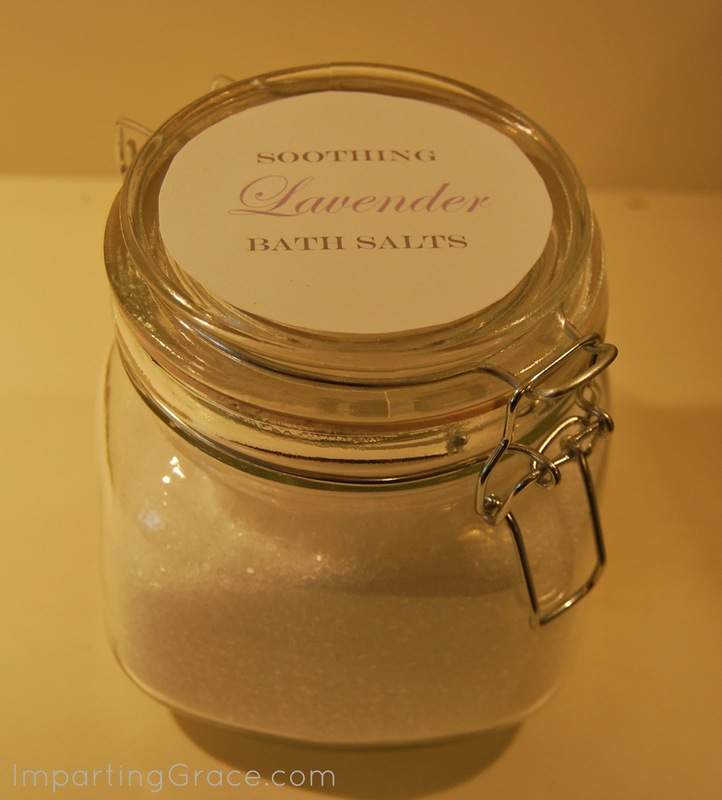 I simply poured some lavender-scented epsom salts into a jar and added a tag. These smell wonderful! I poured a cup's worth of hot cocoa mix into a disposable cake decorating bag, added some marshmallows to the top, and tied it with twine and a tag. Then I simply placed the cocoa mix into a dollar store mug along with a giant peppermint stick. Note: My "tags" are just pieces of cardstock. I used Microsoft Word to create the messages and just printed in the colors I liked, then cut the tags out with scissors. Not very sophisticated, but it works! 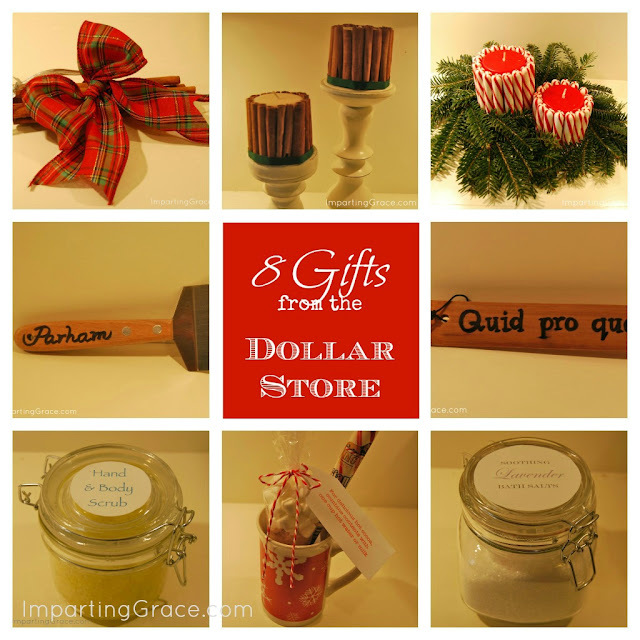 Do you ever use dollar store items to make gifts? I'd love to hear about them! I'm joining the Dollar Store Christmas party hosted by Debbidoo's and Fox Hollow Cottage. I love this post! I love the Dollar Tree here in our town. So many possibilities for crafts and decorating on a budget! Merry Christmas Richella. I hope your son is doing well. I have been praying. Those are all great ideas Richella! I always get inspired when I go to the Dollar Tree! I went to the Dollar Tree and got beer mugs for all the men in my family. I will be etching their names and favorite teams on to them. Easy, personalized gift that isn't much more than a dollar! these are such great and easy gifts! who knew the dollar store could look so good?! These are such cute ideas, Richella! 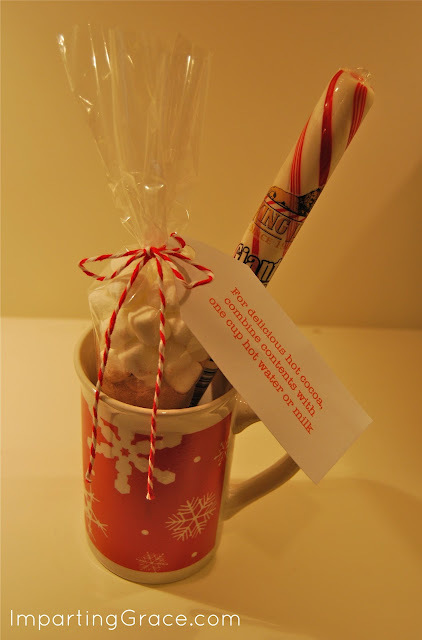 I really do like the cinnamon stick and peppermint candles, and that hot cocoa in the cup is such a perfect little gift! Richella, these are such cute ideas! Thanks for sharing! I need to go by the Dollar Store this week.